Egtvedt Web Design is a one-man company owned by Thomas Egtvedt (blog), located in Oslo, Norway. I’ve worked with clients all over Europe creating websites, flyers, business cards and other marketing material for more than 8 years. 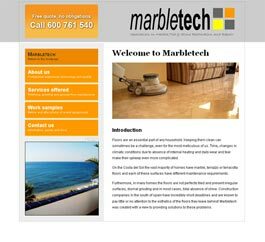 Marbletech is a company specializing in Marble, Tile and Stone restoration & repair. Having worked all over Costa del Sol (Spain) since 2001 they are proud to present their services and work through their new website.